The American unemployment rate dropped to 3.7% in October. This is the lowest level since 1969 and this translates to the lowest unemployment in half a century. Though this is great for job-seekers, it’s tough in a tight labor market for employers. This would mean that they would have to improve perks, policies, and pay to attract the best talent. This presents employers with a need to get creative. This means that they have to make the right tweaks to ensure that new employees stay happy. This could include remote work options to diverse compensation plans. Employers will have to tailor-make employment packages to match their employees. Employers have no choice but to follow the path that successful businesses use to stay competitive in tight labor markets, that is if they want to hire the best resources. They do not look at it as an obstacle but rather an opportunity to demonstrate their companies’ merits and entice soon-to-be employees. While Startup cultures have fun fringe benefits like ping-pong tables, free pizza, and a beer tap, you should consider if it’s worth it at all. Surely, you should wonder if employees would choose to spend a Friday socializing and snacking. It turns out that employees would leave their current job for a competitor if it offered better flexibility and money, and not perks. Not all adult workers enjoy arcade games or a gymnasium, some would rather leave early to pick up their kids and take longer vacations. This means that you should create strategies that would attract talented candidates to join your company. It implies that this job market puts the power in the hands of the worker and businesses cannot simply dish out perks. To attract high-quality employees, you should be practical, provide competitive benefits with a long-term appeal. 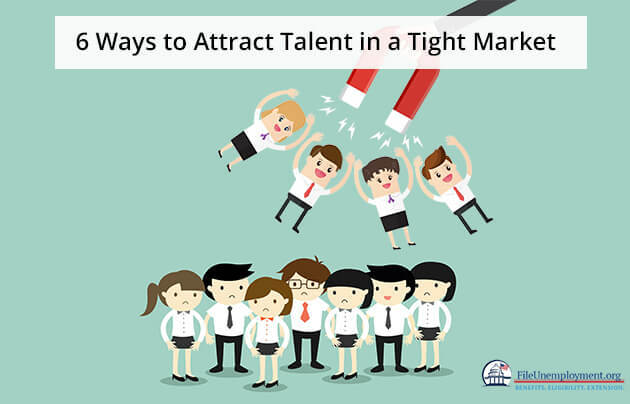 Here are 6 methods to attract the best of talent in a tight market. The student loan debt crisis is bad and getting worse. College graduates are finding jobs, but their wages aren’t going up. Those in the workforce are making payments late and falling into delinquency. This issue does not stop with just students as people older than 60 also have student loans and this has quadrupled over the last 10 years. This terrible cycle can be broken if companies offer student loan support in addition to regular salary. There are providers of the 401(k) programs which offer employers student loan assistance. It’s a given that student loan assistance will help in a long way. Also in addition to this, you can consider offering a mortgage assistance program for housing. The best part is not only will employees enjoy a fast track way to home ownership, but it will also make them stay with the company longer. It is found that 59% of candidates consider travel policies when they choose an employer. They take this into account more than just book a flight. The movement to make employee comfort a priority in business travel plans is what 79% of business travelers regard and this affects job satisfaction. This is important for smart employers as they do not cram employees in the cheapest non-chain hotel closest to the airport. This means that they take care of the small things like storing and shipping business clothing. In a way, this will better the travel experience and make it go smoothly. Businesses should allow traveling employees to earn loyalty perks and points from hotels and airlines for personal redemption. Though these are small courtesies, it will go a long way in making a big difference to the workers. Employees would feel more confident that there would be retirement savings to make it to retirement. It was found that 42% believed that they would need to use money from retirement for other expenses. Employers should work with retirement plan providers and financial service companies to provide employees with resources and tools to plan for the future no matter what their salary grade is. Through retirement literacy and investment-education options, enterprises can help workers make the most of their paychecks. You should not put the resources out there but let employees figure it out themselves. Get financial advisors to come to talk to employees every few months about their options. Also, employers can invest in the workers’ futures and they will more likely to spend that future with the company that helped them. Even if employers find it hard to offer a 401(k) match, employees will still appreciate the savings plan. Even though you introduce ping-pong tables and free alcohol, it’s still not what employees want. They are more interested in stability and flexibility than entertainment. Use practical benefits to attract top talent and retain the best workers. You can get the help of your workforce to find new talent. This can be in the form of a referral program. There are several organizations that have referral programs that use incentives. But this can work without incentives too. This is a great way to reach out to an audience which would be otherwise hard to connect with using the regular channels. These requirements should be something that is actually needed. This means that you should be looking for specific skill sets and measure for those skill sets. You should understand the essential requirements of your position. So you should determine if the candidate needs a high school degree and if they need problem-solving abilities. You should look for basic competency model and assessing candidates for these skills. If you are removing candidates based on criteria that is not essential as compared to those skills that are really needed, then you’re missing out on the picture. 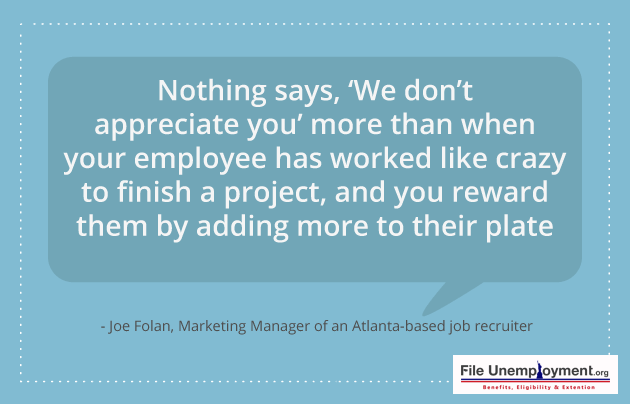 You should be efficient when it comes to hiring. This means that you should have a cut off time to have a hire. Reduce time by using automated assessment as the first step of the application process. Then assess the candidates that meet the requirement and screen out the rest and have the right number of candidates to schedule interviews. You can streamline the process and weed out the individuals through an assessment and this frees out your interviewers to focus on the right people to do the job. With the job climate skewing towards the perfect storm, there are bound to be problems. This would mean that there are unemployment, high job growth and skill gaps in the workforce. These strategies should be used across different industries to make them more efficient and effectively find, hire and retain quality candidates. This will make your organization succeed in a tight labor market. The biggest part of this problem is due to the growth in the manufacturing sector in the U.S. When you start to look at the impact, you will understand that this hampers skills and creates a skill gap which makes it more difficult for talent to find jobs. So, how do we find the right individuals to meet our needs and those that have the right knowledge, skills, and abilities? This means that an organization has to rethink how they attract, hire and retain talent. Read more articles that are beneficial to employers. When the interviews are done and the candidate is selected, you need to write out a job letter. 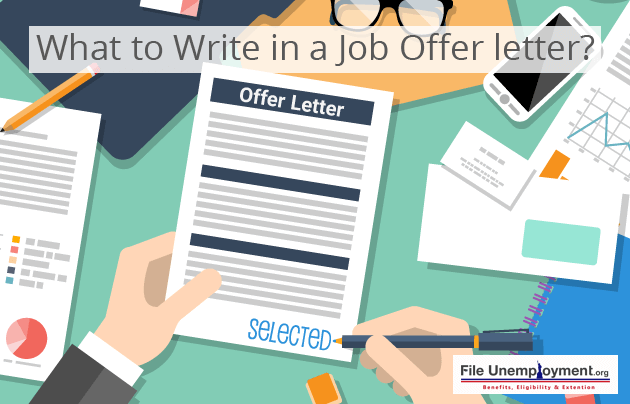 But, what do you include in a job offer letter? In a job offer letter, you have to write a formal written document which is an agreement between the hiring manager and the candidate. Before you go ahead with preparing a job offer letter, you should ensure that you inform the candidate that they have received the position. Based on the company policy, the job offers would be made via email or in writing. Whether the job offers are made phone or email, it has to be followed up by a formal job offer letter. This contains the details of the offer of employment which include the description of the job, benefits, salary, paid time-off, reporting structure and work schedule. Here, the job offer should be conditional and this means that it depends on additional step like a background check and a pre-employment drug test. Those candidates that choose to accept the job offer should return the letter signed as a formal acceptance of the position offered. In case the offer isn’t as expected by the candidate, there is a chance that they might provide a counter offer or decline the offer altogether. Usually, a job offer letter would be sent by email or delivered in-person after the completion of the final interview. 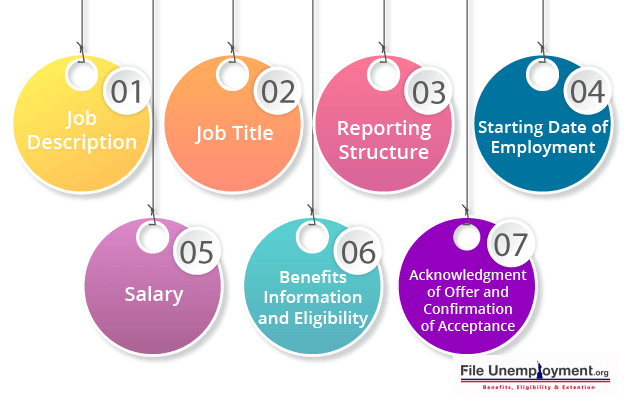 These job offers can also be extended over the phone but it’s important that the candidate receives the job offer an the terms of employment in writing. When writing an email offer letter, you need to ensure that it contains the right subject line, a few lines about the job and the email attachment of the offer letter. When it comes to the subject line, it should be under 50 characters and state what you are offering to the candidate and name of the company. Example: Your Offer from (Company Name). Attach the important document to help the candidate decide if they should accept or decline the offer. The main advantage of sending an email offer letter is that you can attach several additional supplementary documents to help a candidate make their decision. You can add things like company policies, information on benefits and other supporting information. Also, you should avoid overwhelming candidates with documents and provide the right amount of documentation to help them determine whether they make a good fit for the company. You can choose to send the job offer in the body of the email. 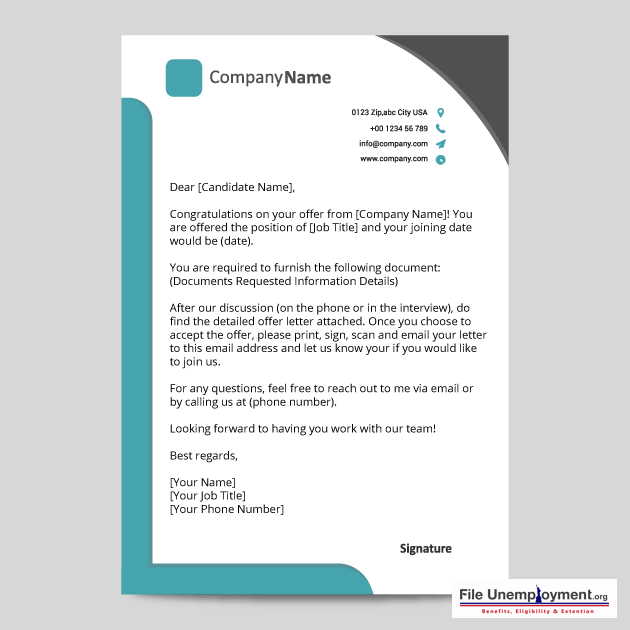 Instead of sending it as an attachment, you can simply copy and paste your full offer letter into the email. After which you can copy and paste the entire offer letter into the email. Here, the candidate will see the entire offer letter and would not have to download the attachment. It should include the job details, compensation, benefits, at-will employment, deadlines for accepting or declining the offer and your contact details. It’s important to ensure that you pay close attention to your start date. This would come across as a big no if this is not mentioned and the candidate does not show up at the right time and date. Also, things like important dates like setting up medical insurance, time off should specify so that you ensure that these formalities are met at the right time and date. Also, you need to specify the appointment, vacation, and retirement in your offer letter. Here, you ensure that the candidate knows about what they are responsible for and the deliverables at the time that they are signing the job offer letter. If they do not agree with the position then its probably because the responsibilities have been misinterpreted. This is why it’s critical that you record these in case the candidate’s job evolves in the future. Though you might have discussed salary via email or on the phone, you need to ensure that it’s on paper too. Things like whether your compensation package meets your candidates’ expectations. Also, if your candidates’ salary is a bi-weekly paycheck and then you should calculate if it matches the yearly negotiated salary. When it comes to salary, another figure that comes to mind is the bonus system. This needs to be described well and ensure that it meets your salary and the guaranteed bonuses. Also, you need to review the type of language used to describe bonuses before its sent out to ensure that candidates do not feel cheated. Another key factor that needs to be reviewed and discussed is the benefits that candidates can avail. This includes things like parental leave, free lunches, pet insurance and several other company perks. One of the most important items that a candidate would sign is the non-disclosure and confidentiality agreements. This is usually the standard practice in offer letters. Usually, this should be kept as sensitive information otherwise this would lead to firing and lawsuits. This could include product design, communications, financial reports and product design. In this way, the candidate will learn his boundaries and know how to keep his work private and ensuring that work is kept on the down-low. The most overlooked yet critical components of an offer letter are the Non-Compete Clause. This contract is between two parties where parties agree not to compete with one another for a given period of time. A non-solicit agreement is a contract in which an employee agrees not to solicit their employer’s customers for a certain period after leaving the company. This comes into force with those that are tempted to quit their job and start their own business using the customers that they have built. An At-Will Employment suggests that an employee can be dismissed by their employer at any time and for reason at all. Though this may sound alarming, this does not mean that the company is known for firing people, this is the law of the land in the United States of America. The last provision is the arbitration clauses which states that if there are any disputes between an employee and an employer then it should be settled by a neutral third party. If you feel that you are between jobs then you should apply for unemployment benefits based on your state. Here you can select your state and learn about how you can claim for benefits. There is a host of resources which helps you with the application, office location, phone numbers, and job training. Among other resources, you can opt for them to use your state unemployment calculator and here you can figure out the eligibility benefits that you can receive based on the number of weeks that you would receive benefits. In the best case scenario, you would be able to start a job and employee several individuals that are like minded in ensuring that they meet your needs. You should look forward to receiving a steady pay. What’s the worst that could happen? You could still receive your unemployment benefits and your severance pay. Also, you can connect with the state through the state pages and browse through the many articles that will help you get another job. Do you still have questions? Connect with the Community Forums to get the quick and accurate answers to all your questions. They are sure to help you on your way and get all your queries answered. Just like how employers have expectations from their employees, in the same way, workers have expectations from their organization. As the younger generations reach the working age and start working in companies, there are certain expectations that they feel are important for a healthy work life. The younger generations are not willing to spend their youth working in an environment that they do not like or spend years working in a job that does not offer any growth. These days, just a fat paycheck and the usual bonuses don’t satisfy employees. These days the management cannot be the only ones who know how everyday activities in the company contribute towards the company’s goals. Even employees want to know the purpose of the work that they do on an everyday basis. 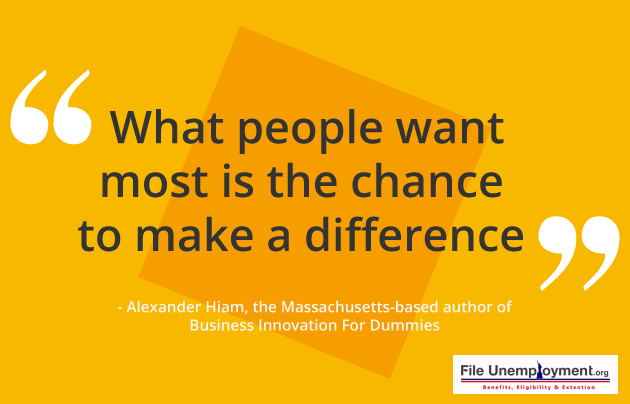 Employees like to see the impact they can make in a company and then achieve it through their hard work. Employees want jobs that have meaning and give them a sense of purpose. This generation likes to work for companies that are socially responsible and impact the society in a positive way. 50% of Millennials would be willing to compromise on their pay for a job that matches their own values. The percentage is likely to be higher for Generation Z. This means that employers must make the employees aware of how their work influences the organization’s progress, especially the younger generation. Workers like to feel appreciated for the hard work that they put in. They work many hours all week long and undergo a lot of stress. All they want in return is to be shown some appreciation or an acknowledgment for hard work. When employees don’t feel appreciated at work, it tends to severely affect the company’s productivity and revenue. There are plenty of ways to show appreciation, however, the simplest are quite often the most effective. As a manager, a simple way would be to compliment your employees telling them why you’d like them to work on a particular task before delegating it to them. To foster a sense of purpose in your workers, it is essential to create a set of clearly-defined goals from time to time. The goals that are set need to be measurable and obtainable. Setting unachievable goals could have the opposite effect and make your workers give up even before they begin to work towards them and could further reduce their morale. Hence, it is extremely important to set goals that are attainable. For example, if you are setting a goal for the sales team, you will need to set the number of deals that the team is required to close in an expected time period for a fixed dollar amount. Employees want their bosses to treat them like humans and be sympathetic towards their personal issues. Dealing with personal issues is bad enough, telling your boss about it becomes all the more difficult, but getting an insensitive or curt response aggravates the situation all the more. Employees need to be treated with compassion. As a manager, when an employee who has personal issues approaches you, put yourselves in his/her shoes and think how you would like to be treated. Employees want to have a sense of belonging in their organization. Many employees have the fear of losing their job. It is vital to be honest with your employees from the beginning and not let their fears get the better of them. However, it doesn’t need to be done if an employee has repeatedly offended the company and is going to be fired due to his/her wrong doings. If employees are not reassured about their job stability, the staff will resign and switch to a different company instead. While a sense of purpose is important, money is essential to survive. Surveys indicate that the number one thing for employees about a job is salary. Everyone wants to be paid for what they’re worth. In order to have bright and skilled talent, employers who can afford to pay should just do that. It could be a pay raise or a periodic performance-based bonus, but it retains resourceful talent. Employees want to learn, grow, get promoted and advance in their careers. In a poll conducted by Gallup, 87% Millennials said development is important in a job. When employees are satisfied with the career development opportunities that are available in a company, the likelihood of them to remain with their employer is high. Nobody wants to do the same work for years and not be given a chance to acquire new skills, grow and advance in their career. There isn’t something that’s much worse than joining an organization and realizing that there is no room for growth. It is important for employers to provide employees with opportunities for advancement and skill set development. Workers spend the majority of their day at their place of employment. They expect to be treated with respect and to be given adequate equipment that’s required to do the tasks delegated to them. Basic features like a desk, working computer, hygienic toilet facilities, kitchen, stationery, etc must be provided. The lack of basic features can cause inconvenience and create a negative atmosphere at work leading to employees leaving the company. The employers need to ensure that the work environment is happy, energetic, interesting and fun. Some surveys report that, apart from salary, workers look for work-life balance while choosing whether to take a new job or leave their current job. The more time employers demand from their employees, the less time they have for social gatherings, hobbies, and learning new skills. Working extra hours creates resentment and risks an employee’s health. Employees want flexible work schedules and telework options that accommodate their personal goals like attending yoga classes or learning a foreign language. Employees want to be given equal opportunity and be treated fairly at their workplace. If one employee receives special treatment, it’s bound to create friction in the team. Whether the inequality is in terms of a better shift, more money, or an undeserved promotion, preferential treatment by an employer can destroy the team spirit and cause demotivation among the team members. If “who you know” becomes a reason behind preferred treatment, it critically affects the employees’ morale. For companies to recruit and retain dynamic, skilled and loyal workers in the organization, it is highly essential for them to meet the expectations of such employees. Workers these days are aware of their worth and if their current employer doesn’t recognize it, they will start looking out for another employer who will. It is highly essential for employers to show their workers that they value them by meeting their expectations. If you have young talent in your organization, here are some strategies to help you retain them. Since the past 8 years, employers have been struggling to retain young employees for a period longer than 2 years. A 2015 College Graduate Employment Study at Accenture Strategy found that 49% (nearly half) of the 2015 graduates consider themselves to be underemployed or working in a job that does not require a college degree. There has been a steady increase in this number, from 46% in 2014 and 41% of the graduates surveyed in 2013. With the increasing trend in the number of young employees quitting their jobs and seeking employment elsewhere, employers have been struggling to retain young talent in their organizations. Some of the proven ways to retain young talent involve adapting the work environment to suit the likings of new graduates. Here are five proven tips from companies that have found ways to keep up with the evolving workplace landscape. The newest graduates in the workforce expect to learn more and develop their skills constantly. In a survey, 77% of the graduates stated that they expect their employer to provide training in their first job, whereas only half of them said they got it. According to another survey, by Deloitte in 2016, two-thirds of millennials are expected to leave their job by 2020. From the workers who wanted to leave their jobs within the next two years, a population of more than 70% stated the reason to be lack of leadership development. The youngest employees should not be blamed entirely for jumping jobs after working for a short tenure. This also implies that, for companies, offering long-term development opportunities can give you an edge over the competition and helps you retain fresh young talent. It is highly essential to provide training to young graduates who join the company. The culture of development needs to be imbibed at every level in the company’s hierarchy. The age-old annual and semi-annual review meetings don’t appeal to the Millennials. They need feedback constantly. If they’ve done well, they like to be appreciated when they complete their task. If there’s scope to improve, they like quick feedback so that they can take corrective measures at the earliest. A survey conducted on 1,000 Millennials showed that over 60% of them want to hear from their managers at least once a day. With a greater amount of communication, employees feel more cared for, learn more and are encouraged to engage in their work better. Unlike the older generations who preferred a hands-off approach, millennials like constant feedback. Among the many millennial-minded initiatives, Donovan from PwC says that the most important initiative at the company was to create flexibility within the workplace. In a firmwide analysis of millennials at the company, 95% of the respondents said that they considered work-life balance to be extremely important to them. Over 25% of the young workers also said that they were disappointed by the amount of balance they were able to maintain. The younger generation values a good balance in their work and personal life. In response to the survey, the higher management began to ask the managers how they would like to help their team members work the hours that suit them. This top-down decision paired with a firmwide contest to submit flexibility plans reformed the company’s culture. Employees at PwC now have the flexibility to work from home when they don’t have client meetings and are allowed to slip out of office for an hour to attend a class during a workday. Young employees love to serve a ‘sense of purpose’. Deloitte surveys have found that, for six in every 10 millennials, this sense of purpose played a role in them accepting their current job offer. Nearly half the people have declined to work on assignments that go against their values. Millennials and Gen Z employees perform well in environments where their work has a clear purpose that contributes to the organization and the society as well. The Federal Government pegs young workers with their purpose. 80% of the young employees in the federal government say that they can see their contributions to the agencies’ goals and 86% say that the work they do is important. The companies that don’t serve an innately motivating mission have the freedom to give young employees a sense of control coupled with purpose by demystifying bureaucracy and increasing transparency. By providing their employees with an ‘insider’, they can give their workers a higher sense of responsibility. The newest college graduates in the workforce prioritize work culture over their compensation. If the work environment has a positive social atmosphere and factors growth, young employees don’t mind getting a lower salary. New college graduates prefer drawing a lower salary when compared to working in a place that is less fun. Employers who delegate challenging work to their entry-level employees and additionally create an enjoyable environment at work have a competitive advantage. Companies tend to regard new graduates’ desires at the workplace as impractical based on their limited work experience. By doing that, they miss out on some of the most talented young workers of the class of recent graduates. While college students show an immense amount of enthusiasm to enter and adapt to a competitive labor market, it’s time for employers to level up and show that they are just as capable of adapting by adopting a flexible work environment. Silicon Valley’s wealth of perks like free food, nap rooms, pet-friendly policies, etc, has raised the bar for many companies. However, these luxuries are often taken as the obvious benefits of a general culture of care that appeals to millennials. The latest graduates are driven by how well their team works together, how supported and appreciated they feel. A family like work culture that is supportive and encourages growth is what attracts young employees the most. Adopting these 5 strategies has changed the dynamics in many companies and has increased the employee retention rate of young talent. Make sure your company’s policies evolve with time. The amount that an employer shells out for unemployment will depend on the sum of his payroll, his track record in keeping employees and the rates that are specific to his state. Besides, all employers should pay a federal unemployment tax that the Internal Revenue Service (IRS) funnels back to the states to help pay administrative costs for unemployment programs. How much is a Claim going to Cost Employers? Most employers are legally responsible to pay premiums into the trust fund on the first $7000 paid to each employee in the calendar year. Premium rates for new non-governmental employers are based on the experience of their industry grouping, if the industry grouping has an extremely high benefit payout. All other new employers are allotted a 2.7% new employer premium rate. In the past, mining and construction are the only industries with new employer rates higher than 2.7%. Employers responsible for premiums for three consecutive calendar years as of December 31 have rates based on their skill. Premium rates vary from 0.0% to 10% for non-governmental employers and from 0.3% to 3% for governmental employers. Local and state governments and certain nonprofit employers have the choice of paying premiums or repaying the trust fund for their share of benefits paid to the former employees. In order to fund unemployment compensation benefit programs, employers are subject to federal and state unemployment taxes depending on several factors. 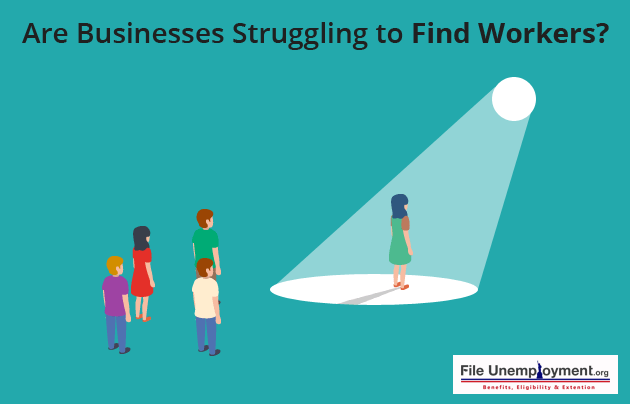 These factors include the sums employers pay their employees, the unemployment claims filed against the business, and the type & age of the business. Employers must pay federal and state unemployment taxes so as to fund the unemployment tax system. Unemployment compensation is intended to pay benefits to workers when they are laid off through no fault of their own. The Federal Unemployment Tax Act (FUTA) imposes a payroll tax on employers, depending on the wages they pay to their employees. Unlike some other payroll taxes, the business itself has to pay the FUTA tax. You do not hold back the FUTA tax from an employee’s wages. Once you fulfill either of the tests, you become liable for the FUTA tax for the whole calendar year and for the next calendar year as well. The FUTA tax is imposed at a single flat rate on the first $7,000 of wages that you give each employee. Once an employee’s wages for the calendar year go beyond $7000, you have no additional FUTA liability for that employee for the year. You can usually claim credits against your gross FUTA tax to reflect the state unemployment taxes you pay. If you paid all your state unemployment taxes on time, and prior to the due date of your FUTA tax return, you will be permitted to claim a credit equal to 5.4% of your federally taxable wages. This will in effect reduce the FUTA tax to 0.6%. Unlike state unemployment tax rates, your federal unemployment tax rate does not reduce if you do not dismiss workers. However you will save money on federal unemployment tax if you have fewer employees with higher earnings rather than a greater number of employees each earning less money. Similar to how the federal UC program is funded; in order to fund each state’s unemployment compensation program almost all the states impose unemployment taxes directly on employers. Also similar to the federal system is the fact that apart from a few states, you do not withhold these taxes from your employees’ wages. If you have employees in New Jersey, Alaska, or Pennsylvania you will also be withholding unemployment taxes from your employees’ wages since these states assess unemployment taxes on employees. Your state unemployment tax rate is based on your history as an employer. When you first open your UI account, your tax rate will be fairly high because you have no track record. If you work for several years without laying off an employee, your tax rate will go down. If you continually lay off employees, your tax rate will increase. Are you Liable for Your State’s Unemployment Taxes? In nearly all states, if you are subject to the federal unemployment tax, you are automatically accountable for the state unemployment tax. In the remaining states, broader tests are applied for taxability. It means that if you have employees in the states with the broader tests for taxability, you may finish up paying state unemployment taxes even if you are not obliged to pay the federal ax. Computing what you owe in state unemployment taxes is just a matter of multiplying the wages you pay each of your employees by your tax rate. However, each state confine the tax you have to pay with respect to any one employee by detailing a maximum wage amount to which the tax applies. Once an employee’s wages for the calendar year surpass that maximum amount, your state tax liability with respect to that employee ends. The sum that you pay in the unemployment tax depends on the total sum of your payroll. Both federal and state unemployment taxes are computed as percentages, so higher gross payroll will convert to a higher unemployment premium even if your tax rate is low. However, wages subject to federal unemployment taxes are limited at $7000 per employee, so federal unemployment tax depends less on the wages paid to each employee. If you are laid off due to conditions that are not your fault, you are entitled for state unemployment benefits. You are qualified to obtain unemployment if your employer lays you off due to lack of work, but you are not allowed if you simply do not feel like getting up and going to work unless you have a medical condition that makes it difficult to do so. Your employer does not directly pay the unemployment benefits that you receive, but he will pay a higher unemployment tax rate because you have made a claim against his account. Employers are financially responsible for the unemployment benefits paid to the unemployed. That is, each state taxes its employers for the unemployment benefits it gives out. Not for profit entities often pay on a per claim basis: they pay a tax which equals what claimants receives at the time they receive it. For profit, businesses pay through a payroll tax. 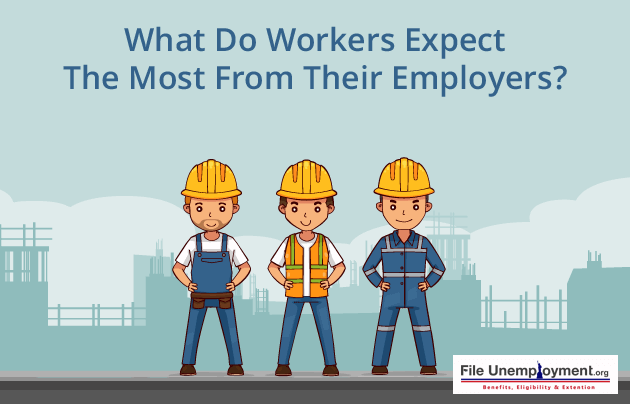 Significantly, this tax varies from year to year, depending mostly on the experience an employer has with former employees collecting unemployment benefits. Many employers figure that unemployment taxes are just a cost of doing business. They don’t realize that many of their former employees are likely ineligible for unemployment benefits. They don’t realize that they can fight many claims and keep their unemployment taxes low by denying unemployment benefits to people who should be judged ineligible for them. Meanwhile, the cost of these claims causes the employers tax rates to rise. Awarded unemployment claims cause a company’s unemployment tax rate to rise in future years. Your company’s unemployment tax rate, therefore, is experience rated: it goes up or down over time depending on your company’s history with awarded unemployment claims. In Illinois, for example, rates vary between 1.0% and 8.2%. The first $12,000 of each employee’s wages will be taxed in 2008. So, a million dollar taxable payroll can have unemployment taxes between $10,000 and $82,000. Obviously, lower tax rates make a difference to your bottom line. Many companies have very high rates, and even companies with lower rates could pay less unemployment taxes if fewer employees collected benefits that were chargeable to the company. The actual cost of a claim may vary, since claimants may collect just 2 weeks or 26. The average claim costs an employer $4200 but claims can cost a company in excess of $10,000. Each claim can affect 3 years of unemployment tax rates since state formulas used to assign rates ordinarily use a 3 year moving period to assign a tax rate. This is one reason why employers don’t realize the expense involved in a single claim. The expense is spread over a three or four year period. Smaller employers are hit harder by single claims than larger ones, though the different impact of a claim on a tax rate does not change the actual cost to the employer significantly. The average cost, big firm or small, of an unemployment claim is 4200. Employers can contest the cost of these claims by fighting unwarranted applications for benefits. Employees terminated for misconduct or employees who quit for reasons not attributable to the employer are legally not entitled to unemployment benefits. Is it Fair for a Business to Deny Unemployment Claims? The unemployment system basically exists to award benefits to the unemployed but it only wants to give money to people who are unemployed through no fault of their own. If someone is at fault for being unemployed, they should be denied. People are at fault if they have committed misconduct at work or have quit by their own choice. When people collect benefits after they have been fired for misconduct or quit for personal reasons not attributable to the company, they cost their employer lots of money. It is a fair guess to say that each awarded unemployment claim costs the former employer more than $5,000. That is, the charges for their claims raise an employer’s unemployment taxes unnecessarily. How much are the Employer Taxes? Taxable employers pay a certain percentage on the taxable earnings of their employees. Most states tax the first ten or fifteen thousand dollars of earnings. Tax rates often vary between one percent and ten percent. Tax rates are established by a formula that calculates total unemployment charges and compares that to the size of a company’s taxable payroll over a three year period to give a tax rate. How can a Company Get a Lower Rate? If a company has a million dollar taxable payroll, a one percent difference in unemployment taxes means a savings of ten thousand dollars. It is in a company’s financial interest to get the lowest rate possible. In simple English, if a company has fewer unemployment charges, the lower the tax rate. The employer can even get lower charges by fighting unwarranted claims. If employers do not fight unemployment claims, they are meekly acquiescing to their costs. This permits claimants who behaved badly at work to collect a reward for their bad behavior and it insures that the employer pays an unreasonable tax expense. If a company fights claims where former employees were fired for misconduct or quit, the company likely will get a lower rate. Often, a company is more successful if it uses a third party claims administrator to do this work. Third party administrators often charge very low fees. This is a guest post written by David Prosnitz of “Personnel Planners”. His company provides unemployment cost control services to employers. When the claim comes, they write protest letters, make appeals to unemployment hearings, represent at these unemployment hearings, appeal those decisions when they seem reversible and audit the quarterly unemployment charges a company may get for awarded unemployment claims. You can get more information on their website: www.unemploymentclaims.com where there is free information and training on how to make a defensible employee termination.